Read the full Italy Charter Guide. A 14-day private yacht charter itinerary visiting picturesque and historical places in Italy. Enjoy a cool welcome drink before setting sail for the island of Ischia, famed for its healing spa waters. Take a berth in the lively port of the quaint port of Lacco Ameno or anchor off Forio. Spend your first night onboard and enjoy a dinner under the stars, prepared for you by crew. Awake at leisure and enjoy a delicious breakfast before heading out to Negombo in the town of Lacco Ameno. This is one of the best spas on the island and is situated on a beautiful bay with private beach and swimming pools of different temperatures. There is also a beauty centre where you can enjoy a range of treatments. After being pampered, you may wish to take a short tour of this beautiful island. Stop at Pietratorcia vineyard where you can taste the wine and sit down under the cool pergola. Return to the yacht and enjoy lunch before picking up anchor and cruising around to the fashionable southern port of San Angelo where the cobbles streets are brimming with sea side restaurants and boutiques. You may like to enjoy dinner out tonight at Restaurant Neptunus for dinner. Enjoy breakfast before departing for the small island of Procida. A volcanically formed island of great natural beauty and a rugged coastline. Head into the small comfortable harbour of Chiaiolella, situated on the ledge of a extinct Volcano. Is sheltered by a luxuriant hill that rises an Vivara, where it’s possible to admire the ancient remains of an ex-convent of Benedictines of the VIII cent. Take a walk to explore the small island of Vivara which connects to Procida with a bridge and is a natural reserve and a haven for all types of flora and fauna. Alternatively, stay onboard and anchor in one of the tranquil bays. Swim – relax – sunbathe and enjoy a long and lazy lunch. After lunch, enter Marina Grande in all its splendid and admire the magniloquence of colours in the splendid embattled mansions. Today will be a very relaxing and peaceful day as you sail north into the islands of the Pontines. Ventotene is one of the smaller islands in the Pontine Archipelego. It is an elongated and narrow, gently undulating and rising at the extreme western end to a height of 139 mtr. The volcanic origins of the island are evident from the prevalence of basalt and tufa rock. On the east side there are wide coves, which allow easy access for boats, particularly the beautiful Roman harbour. After breakfast, continue north to the Greek style island of Ponza, famed for its crystal clear water. Anchor off in one of the beautiful bays surrounding the island. Enjoy a relaxed day of swimming and snorkeling in these blue, clear waters. Get the crew to take you for an exploratory trip around the coast to explore some of the wonderful caves and deserted forts nestled around the island. In the late afternoon, head into the tiny port of Ponza. Go ashore and stroll through the ancient cobbled streets before heading out this evening for a traditional fresh seafood meal at a local seaside tavern on the port. 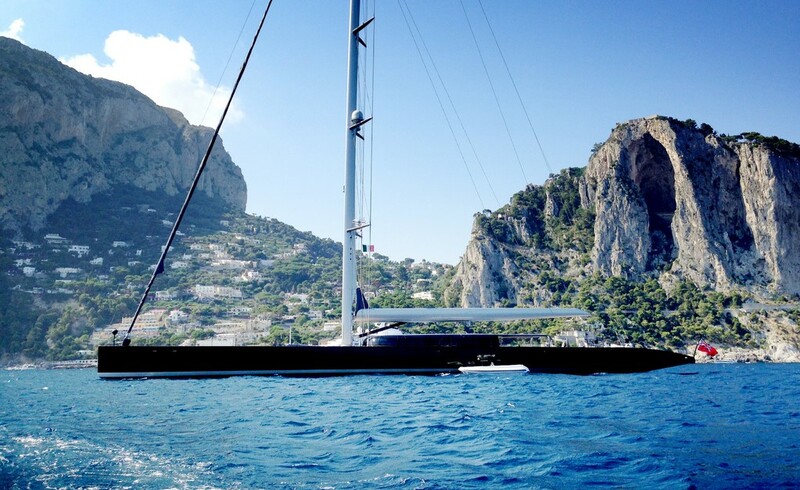 Awake reasonably early and prepare for a full day sail back to Capri. Anchor in the shelter bay of Anacapri. Capri – There’s plenty to do in the world famous island of Capri which is both charming and elegant. Take the tender early in the morning and explore the famous Blue Caves before the tourist boat arrive. Later in the day, you may wish to take a gondolier chair lift up the mountain side in Anacapri which offers spectacular views of the islands. Capri is the ‘people watchers’ paradise and you can’t leave without simply sitting in a café for an hour or so and watching the rich and beautiful world stroll by. Today set sail for the Amalfi Coast and the first town of Castellammare. This afternoon, take a trip to explore the ancient buried city of Pompeii. Although fascinating, a few hours will be enough before you’ll be ready to return to the peace and cool relaxation onboard where you can enjoy a sunset cocktail and a delicious meal onboard. Spend the morning enjoying Positano. You may like to indulge in a spa treatment or lunch. After lunch, continue onto the port of Amalfi where you could try to Michelin starred Ristorante La Caravella. Amalfi, also scenic is famous for its 6th century Duomo, which is a fascinating blend of culture and architecture. The Duomos original facade is in Oriental style, garnished with brilliant mosaics and bronze doors. Beside the Duomo, sits the Cloister of Paradise, built in Arabian style in the 13th century. It holds ancient sarcophagi, marble sculptures and mosaics. Today you may wish to take a private half day tour up to Ravello. Spend the morning exploring followed by lunch in one of the local restaurants or Hotel Caruso Tel which offer magnificent views over the valley to the Bay of Naples. The slow uphill drive along a very narrow road passing several vineries and olive factories etc, leads to Ravello, a rural village unspoilt by tourism, perched on top of the mountain cliff situated above Amalfi and Minori. Ravello, being famous for its breath-taking views, natural beauty and ancient monuments are presented at their best in the gardens of Villa Cimbrone and Villa Rufolo. In high season, these gardens are rich in sweet secants of blooming flowers, shadows of flora and perfume of lemons. Apart from the main cathedral, also situated in the square, and a history museum constructed in the basement of the cathedral, there are many other churches to visit given that there used to be a total of over 13 churches in the village. Along the narrow arcade of Via Roma one will find a few small boutiques, and scattered around the vicinity are some traditional local restaurants with a cuisine quite different from those close to the sea; Cumpà Cosimo, Da Salvatore, Villa Maria, Villa Amore, etc, are all exceptional. Return to the yacht for a rest and some relaxation time and enjoy dinner onboard. Cruise today to Agropoli where you can go ashore to visit one of the best preserved Greek temples in the Mediterranean situated at Paestum, about 20 minutes along the coast by road. Today head back to Capri as no doubt, there was plenty you didn’t get to do when you were there last. A few final shops to visit, beaches to swim at and restaurants to try! Cruise to the stunning town of Sorrento which sits perched high on a Cliffside overlooking the bay. You may like to try Hotel Capo al Gala for lunch which serves simple and genuine Campania regional dishes but offers magnificent views of the bay from its terrace balcony. Set sail early this morning back to Naples and prepare to disembark at midday.